oil on canvas, 20” x 32” from the Collection of Perry Gwynne More Austin Jr., M. D., and Camilla Austin Andrews. Captain Sam Burtis Jr. (1884-1888, 1891-1892, 1896, 1898-1899) was her captain when she was wrecked at San Miguel Island. 1888: According to the New Directory of the City of Santa Barbara, 1888, Samuel H. Burtis, Jr. was captain of the schooner Santa Rosa. January 5, 1893 [LAT/SB]: “The schooner Santa Rosa came in from Santa Rosa Island Tuesday night. 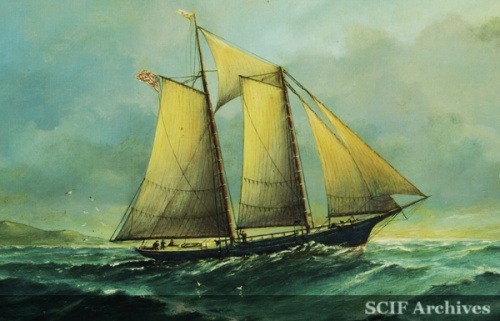 December 8, 1898 [ ]: Captain Burtis rescued the crew of the Helene who stranded at Forney's Cove on the schooner, Santa Rosa.